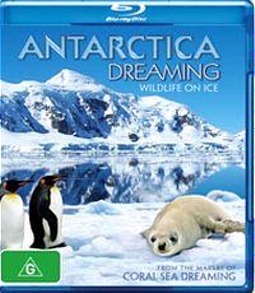 Another impressive BBC documentary arrives on DVD with Antarctica Dreaming - Wildlife On Ice which comes from the producers of Coral Sea Dreaming and this Blu-ray revolves around the wondrous creatures of this icy wasteland. Although documentaries on Antarctica are a dime a dozen, there are a few standout moments in this well produced film which showcases the animals that live there and also the harsh landscape. From King Penguins to Elephant Seals, what makes Antarctica Dreaming - Wildlife On Ice so engaging is the high definition video quality that looks stunning on our Panasonic LCD. The cinematography is perfect and there are some great close-ups of these amazing creatures. Although the quality is a little lacking compared to Planet Earth, the image quality is still nothing be quaffed at. The sound quality is Dolby Digital 5.1 and although the music is quite ambient, it's hard to make the sound standout but everything is crisp and flawless in this department. At the end of the day, Antarctica Dreaming - Wildlife on Ice is an inspirational documentary on Blu-ray that really makes you appreciate the wonders of this planet and how diverse the animals are on this planet, especially how resiliant to the climate. If in doubt, rent it but for those looking for a well made wildlife documentary on Antarctica, than this is one of the better ones.